In the battle for midsize-sedan supremacy, there’s one that stands out from the pack. Drivers around Mechanicstown will love the 2014 Honda Accord — like its predecessors, it offers a supremely comfortable ride, impressive fuel economy, and excellent features. That said, all of us at Middletown Honda are well aware that the midsize-sedan segment is a tremendously competitive one, and we understand that many drivers want to shop around. One of the Accord’s biggest competitors is the 2014 Mazda6 — so how do these two vehicles stack up? Fuel economy is one of the closest points of contention for these two sedans, but the 2014 Honda Accord Sedan CVT (with the 4-cylinder engine) inches just ahead by managing 27 mpg city. * The Mazda6 manages 26 mpg city on automatic transmission models with the base 2.5L engine. Features are an important part of any vehicle, and the Accord shines by offering a rearview camera, dual-zone climate control, and stereo anti-theft as standard equipment — all features that are either optional or unavailable in the 2014 Mazda6. 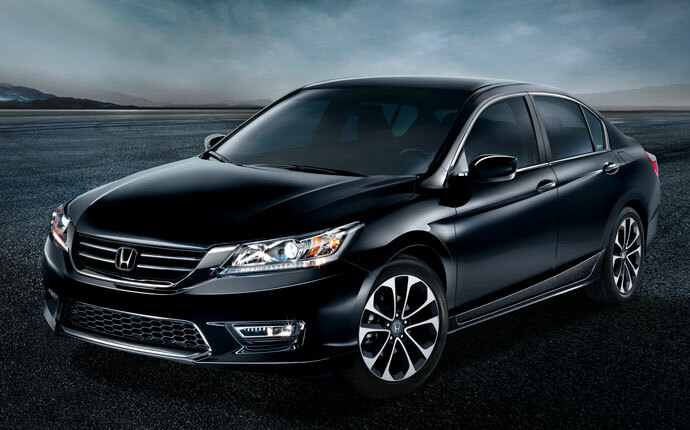 In terms of passenger and cargo capacity, the Accord boasts a significant advantage. For one thing, it has greater cargo volume. For another, the Accord has greater passenger volume, which translates to superior front and rear headroom and shoulder room. If you want the extra space, the Mazda6 isn’t for you. While the Mazda6 might be a solid choice for some drivers, we think it will be hard to go with when the 2014 Accord is available. The 2014 Honda Accord can take on all comers. If you want to learn more, or to take a test drive of any vehicle in the Honda lineup, you should make your way to Middletown Honda. Mechanicstown drivers need only travel a couple of miles north to find our dealership at 520 Rte. 211 E in Middletown, NY. We’re confident that you’ll be impressed with everything that we can offer, so come see us soon! *24 city/34 highway/28 combined mpg rating for 4-cylinder Sedan 6MT models. 27 city/36 highway/30 combined mpg rating for Sedan CVT models. 26 city/34 highway/29 combined mpg rating for Sport Sedan CVT models. 21 city/34 highway/26 combined mpg rating for V-6 Sedan models. Based on 2014 EPA mileage ratings. Use for comparison purposes only. Your actual mileage will vary depending on how you drive and maintain your vehicle.